This award-winning science fiction classic explores a far-future world inhabited by intelligent canines who pass down the tales of their human forefathers. Thousands of years have passed since humankind abandoned the city -- first for the countryside, then for the stars, and ultimately for oblivion -- leaving their most loyal animal companions alone on Earth. Granted the power of speech centuries earlier by the revered Bruce Webster, the intelligent, pacifist dogs are the last keepers of human history, raising their pups with bedtime stories, passed down through generations, of the lost "websters" who gave them so much but will never return. With the aid of Jenkins, an ageless service robot, the dogs live in a world of harmony and peace. But they now face serious threats from their own and other dimensions, perhaps the most dangerous of all being the reawakened remnants of a warlike race called "Man." In the Golden Age of Isaac Asimov and Robert A. Heinlein, Clifford D. Simak's writing blazed as brightly as anyone's in the science fiction firmament. 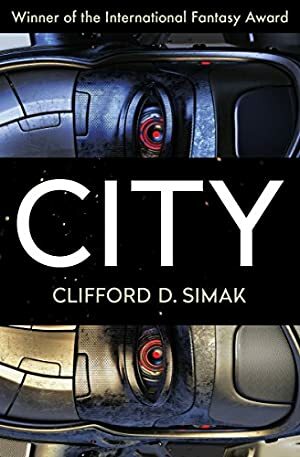 Winner of the International Fantasy Award, City is a magnificent literary metropolis filled with an astonishing array of interlinked stories and structures -- at once dystopian, transcendent, compassionate, and visionary. Track It. This book has been $0.53 within the past year. Log In to track Clifford D. Simak on eReaderIQ. to be notified each time the price drops on any book by Clifford D. Simak. to stop tracking Clifford D. Simak. Log In to track David W. Wixon on eReaderIQ. to be notified each time the price drops on any book by David W. Wixon. to stop tracking David W. Wixon. We started tracking this book on June 4, 2015. The price of this book has changed 106 times in the past 1,419 days. The current price of this book is $7.99 last checked one hour ago. This lowest price this book has been offered at in the past six months is $1.99. This lowest price this book has been offered at in the past year is $0.53. The lowest price to date was $0.53 last reached on July 24, 2018. This book has been $0.53 one time since we started tracking it. The highest price to date was $7.99 last reached on April 19, 2019. This book has been $7.99 7 times since we started tracking it. We last verified the price of this book about one hour ago. At that time, the price was $7.99. This price is subject to change. The price displayed on the Amazon.com website at the time of purchase is the price you will pay for this book. Please confirm the price before making any purchases.